The Engel MT45FP is Australia's most popular portable fridge. This Engel has a 40 litre capacity and can be run on fridge or freezer. Generally however most campers will use it on refrigerate. If you decide to treat yourself to an Engel MT45 FP you can be sure you will not go wrong and will join thousands upon thousands of happy Engel fridge owners! 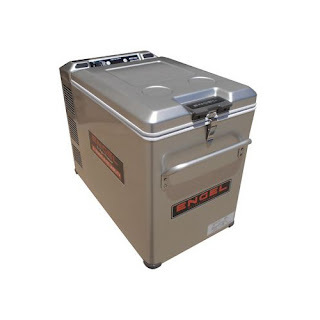 The ENGEL MT45FP Compressor Fridge remains an extremely popular choice for campers in Australia. Engel has been long respected in Australia as being the toughest fridge in the market. Engel, over the last 50 years have been ensuring that this remains the case. Engel fridges are known for their rugged steel exterior, and their durable sawa-fuji compressor specifically designed for off-road use. Listen to why Malcolm Douglas loves and recommends his Engel MT45FP! The latest edition of the 40 litre Engels is the MT45FP, there is also a limited edition 50th anniversary Engel currently available the Engel MT45FG that has some additional features and accessories not currently available in any other Engel. Two input plugs - one 12v-24v and one 240v. DC power consumption: 0.5 to 2.5 amps. Engel have also released a poly fridge that is lighter to carry and leaves a smaller burden on your wallet whilst keeping the sawa fuji compressor. This fridge is called the Engel Eclipse MR40F. The Eclipse has a 38 litre capacity. Do you own an Engel? How have you found it? Would you recommend it to others? Comment below!